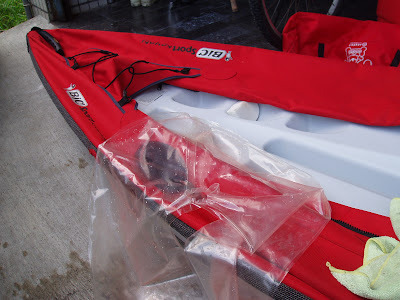 The Bic Yakka 80 is one of the new boats you may have seen in the magazines, and as my kayaking took me to a new level of wanting a fast and portable travel boat, I bought a Yakka. Folding kayaks seemed to take too much set-up time, and inflatables seemed like dowdy water plows. 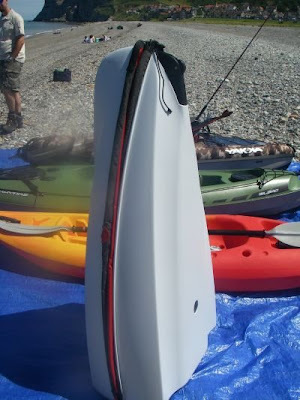 The Bic Yakka series appeared to be the best of all worlds: rapid set-up, great design, and a fairly fast rigid hull. Did it live up to the promise? Yes, with some limitations. The Yakka 80 is rated at 176 lbs max, and my 168 lb frame does not seem to sink the boat, and there seems to be weight to spare. The 9 foot 4 inch open length is compact, and there is a built in roller to pull the heavy 46 lb yak (two roller wheels would have been better than the one provided). Red inflatable cordura perimeter atop what is essentially a foldable sit-on-top, the boat sets up in about 120 seconds. Unfold, screw down a stabilizer bar, and inflate. I inflated this boat easily with my mouth (pump included but not mandatory). On my inaugural paddle, I was impressed by the speed of this boat and despite its short length and wide beam, it tracked fairly well as long as my paddle stroke was even and steady. I was impressed at the efficiency. It really punches through the flat-water (doubt this boat would be any good at all in waves and chop—get a folder for those conditions), which is what I wanted rather than an inflatable hull water plow. An immediate drawback was noted, and that is water coming in the midhull line where the two base hull pieces meet, i.e. some water comes in at the folding “joint”. How much? A lot! Enough for a wet butted ride certainly. I added a Surf-to-Summit SOT seat, which fits handy built in clips on the Yakka (even Bic was thinking you’d add a seat, I suspect), and was able to sit above the water and not get wet at all for my subsequent rides. I would say that the seat is mandatory. I find that the water ingress, although slightly disarming, hits a certain level and then stops, thanks to scupper plugs that allow a balanced egress. Thus, you will not get flooded, you’ll just feel like your getting flooded. I emailed Bic about this, asking for advice and to share my commentary, but the company has not responded after two months. Urban Aero Systems is engaged in Aero Boats and Flight simulators, assembly and marketing. I really like your blog. I really appreciate the good quality content you are posting here for free. I was looking to buy an bravo hand pump but was looking for all the characteristics. Thanks for sharing all the information with us.